This casual Westport sofa features a charming sea-side look that reminisces of traditional cottage styled homes with a fresh furniture style. A plush three over three cushion construction provides the primary style element of this timeless furniture piece, while a traditional kick skirt and formal flared arms add a charming accent of up-to-date style. Complete with welt cord trim and a fine fabric upholstery, this living room sofa compliments casual and formal homes with traditional, cottage and contemproary styles. 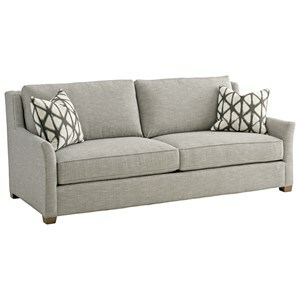 This davenport comes from a collection that also features an un-pictured loveseat, chair and slipcover sofa. The 678 Casual Westport Sofa with Traditional Kick Skirt by Braxton Culler at Jacksonville Furniture Mart in the Jacksonville, Gainesville, Palm Coast, Fernandina Beach area. Product availability may vary. Contact us for the most current availability on this product.